Everywhere over the countryside, over Illinois from one end to the other, from the Wisconsin border to the meeting of the rivers at Cairo, from the Wabash to the Mississippi, and over a large part of the entire continent, from British Columbia and Maine to Texas and Arizona and Georgia, the heath aster in September is in blossom. It is one of the most abundant of all wild asters. The white frost of heath asters whitens almost every country road, borders almost every pond and swamp, frosts the uplands and is a mist of white in the lowlands. It is a simple little white aster with a yellow center and it grows almost everywhere. September - October Roadsides, fields. 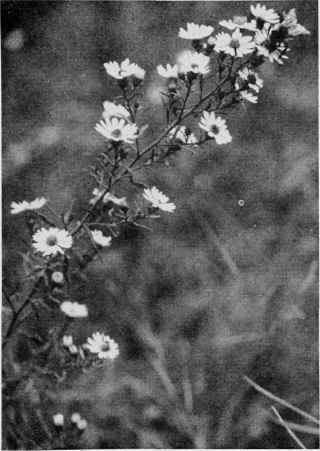 The heath aster arranges its small white flowers along secondary stems which branch methodically from the curving main stem. The whole stalk forms a bending garland of white flowers which are lightly set and host to flying insects when the sun is warm. The leaves of heath aster, are thin and short and narrow, rather like those of the heath itself, Erica, which resemblance gave the aster its common name. There are many small white asters in autumn; there are so many that they add only confusion to an already confusing plant group. There is the loosely flowered Tradescant's aster (Aster tradescanti) named for John Tradescant who had the plant growing in the king's gardens at Lambeth. There is the little wreath aster (Aster multiflorus) which has its bending branches thickly set with tiny white flowers half the size of the heath aster but more than twice as abundant. The entire plant is a wreath of flowers and forms grey-white masses along roadsides.